Ground beef seasoned with a Korean based umami sauce, baked, and served with a Gochujang mayonnaise dipping sauce. Heat a skillet over medium heat and cook the beef until no longer pink. Drain any excess fat off the pan. Add the onions and garlic and cook for 2-3 minutes, until they start to soften. Add all the remaining ingredients (except the cabbage) and cook for 5 minutes, or until all liquid has been absorbed. Remove from heat and let cool a few minutes. Place 1 large tbsp. of filling in the center of an egg rolls wrapper. Add 1 tbsp. shredded cabbage. Roll into an egg roll as demonstrated in the photos above the recipe. Roll remaining egg rolls and place on the parchment lined baking sheet. Brush each egg roll with the cooking oil (both sides). Bake for 20 minutes, flipping the egg rolls halfway through. Remove from oven and serve with gochujang mayonnaise. 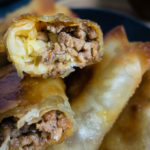 Egg rolls can be made ahead and frozen. Roll each egg roll individually in foil or plastic wrap and place in a freezer bag (or other freezer safe container). When cooking from frozen, brush with oil as done above and add 5 minutes to the cook time. Egg rolls can also be fried. heat oil in a cast iron skillet to 350 degrees. Fry the egg rolls for 3-5 minutes per side, or until golden brown.